launch profitable businesses FAST on Amazon! I am so grateful for this group! My first $1k day and first $10k in 30 days. I have been on this adventure for a little over a year. I'm a stay at home mom (homeschool), source and package everything myself. 35-50% ROI. Before I joined the Q4 group in mid September, my sales were ~$4k/month . . . I always dreaded RA before I learned how . . . with Danny. I put the knowledge to use instantly and sent loads of inventory in to FBA. 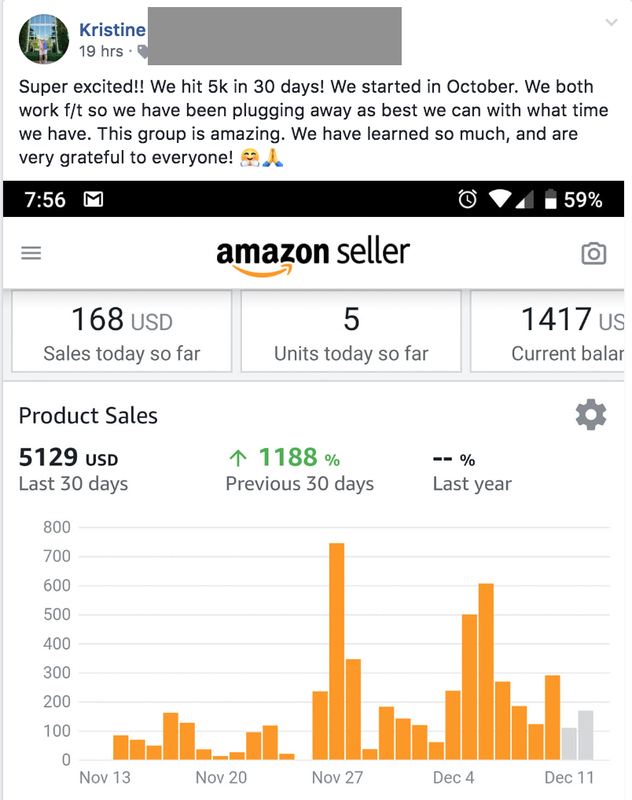 My sales for October have doubled and I hit my first $900 day! First $1000+ day! You guys are amazing!!!! THANK YOU!!! Are you tight on cash, but looking to start an Amazon business this week? Would having a proven, step-by-step guide help? Are you ready to stop dreaming about making money online and start earning? If you answered yes to any of these questions, you are in the right place. I’ll explain why in just a little bit, but let’s cover an important truth right away. We’ve all been taught that you need a lot of money to make money. But what if this is false? I started with zero dollars and an attic full of used items to sell on eBay. You need some capitol to sell on Amazon, but you can sell just about anything on eBay. I raised $3,000 and launched my Amazon business. Get a credit card. Don't ever charge more than you have coming back in your next disbursement. I rolled it all back in without paying myself anything for almost 2 years while working full time as an Uber driver. Now I enjoy a 6 figure income and I only work 2 or 3 days a week. Our FBA business was born almost exactly 3 years ago, and I cannot tell you the world of difference that it has made for us. It took a while to build our capital, because we started at less than zero, but we just kept rolling the money back into the business as if it didn't belong to us at all. 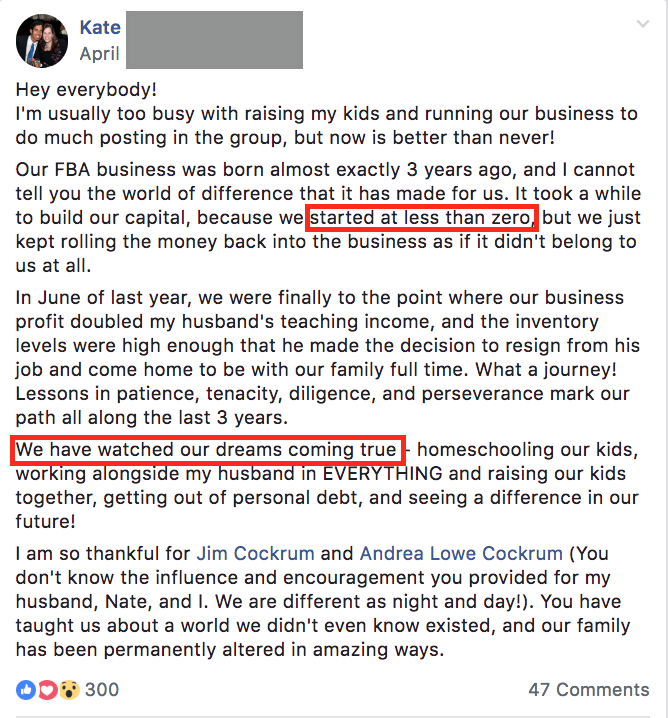 In June of last year, we were finally to the point where our business profit doubled my husband's teaching income, and the inventory levels were high enough that he made the decision to resign from his job and come home to be with our family full time. What a journey! Lessons in patience, tenacity, diligence, and perseverance mark our path all along the last 3 years. We have watched our dreams come true. Homeschooling our kids, working alongside my husband in everything and raising our kids together, getting out of personal debt, and seeing a difference in our future! I am so thankful for Jim and Andrea Cockrum. You don't know the influence and encouragement you provided for my husband, Nate, and I. We are different as night and day! You have taught us about a world we didn't even know existed, and our family has been permanently altered in amazing ways. ​After teaching thousands of students how to use the Internet creatively to build successful businesses, we KNOW it is NOT true that you need a lot of money or special skills to build your business online. Why is it important that you realize that you don’t need a boatload of money to make money? Because if you have been unconsciously accepting this principle as true, it will keep you from building a successful Amazon business. Our flagship course (actually, library of courses), the Proven Amazon Course is the world’s top-rated Amazon course and has allowed thousands of students experience the freedom of making enough money to support their families and making their own schedules. Can You Trust Our Teaching? 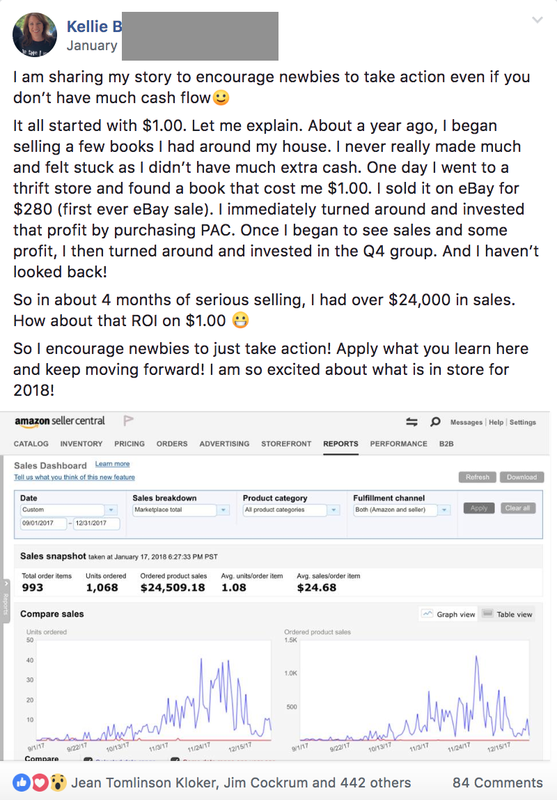 Kristine Young is one out of hundreds of students that has experienced success after learning from our experienced teachers how to build an Amazon business. Within two months of starting, together with her business partner, she reached $5,129 in sales even though they are both working full-time. You can make $300, $500 or $10,000 a month selling on Amazon regardless of how much time you have, how much money you have to invest, or what your personality is. You see, many teach how to start businesses on Amazon; but most of these businesses require large startup capital and risky investments. We disagree! The smartest and safest way to build an Amazon business is to use low-risk, low-cost methods that work long-term (not gimmicky “loopholes” that work for a month or two until Amazon finds out about them and closes down the accounts of those using them). Wouldn’t you agree that this is the smartest approach, especially for people who happened to be tight on cash? But even if you have a big budget to get started, why would you want to lose that money on untested inventory? 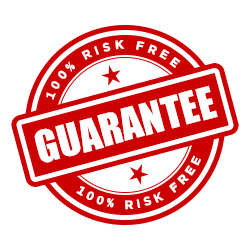 Does this low-risk approach make sense to you? It surely does make sense to us! That’s why we teach it around here. What is The #1 Problem New Sellers Have? After surveying our email list, in order to identify what keeps people from starting their Amazon business or what makes them frustrated, we discovered that the #1 response was a lack of step-by-step instructions. For this reason, we decided to create a simple step-by-step course that shows you the easiest and the safest way to start your Amazon business . . . this week . . . using Retail Arbitrage. 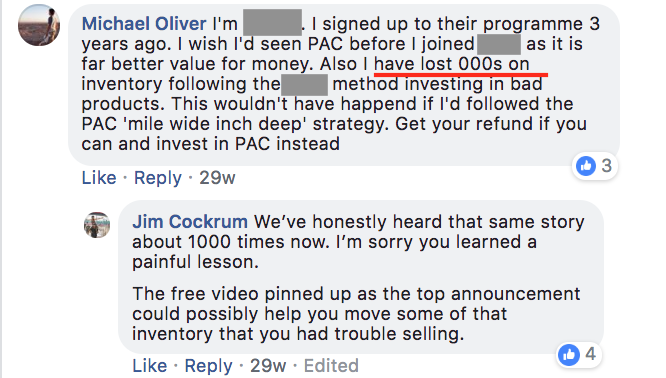 This works even for people who might have tried arbitraging before but ended up frustrated and unable to grow their business to more than a few hundred dollars. In this course, we reveal the one thing that will make retail arbitrage scalable; you will learn how to use this tip to build a real business arbitraging. In a few moments, we’ll reveal how you can get access to this step-by-step course. Today. Absolutely risk-free. But first I want to mention the other two highest problems we identified as stumbling blocks for most sellers. The second most common problem was lack of capital (i.e., no money to invest in products) and the third most common problem was lack of confidence (i.e., not knowing where to start). If you experienced any of these feelings or problems, then you are not alone. Most new sellers experience the same feelings and frustrations. Know exactly what to do at each step, what to look for, what to sell, and how to grow. Of course, the more time you have to learn and to apply these strategies, the quicker you’ll find success. But anyone can do this. But if you plan to take action (the right type of action), then it does not matter where you are in life . . . this course is for you. When my mom lost her job, I kept telling her she should start selling on Amazon. She was hesitant. 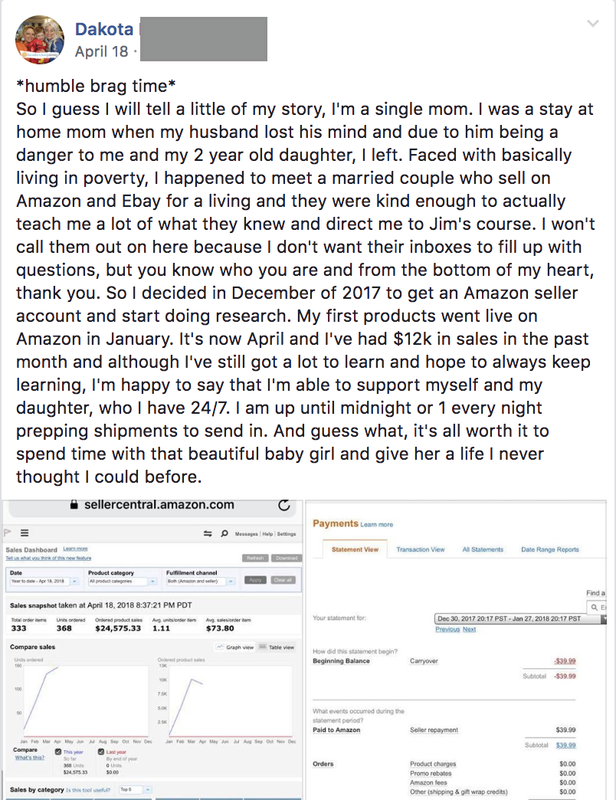 After all, she barely used a computer before (she really only accessed her bank online), and didn’t believe she could learn how to make good money on Amazon. She didn’t even use a GPS before. I started teaching her the simplest business model I know: selling used books on Amazon (taught in module 3 of this course). The first month, she sent a few books we still had around the house. And then she found a few books at second-hand stores. 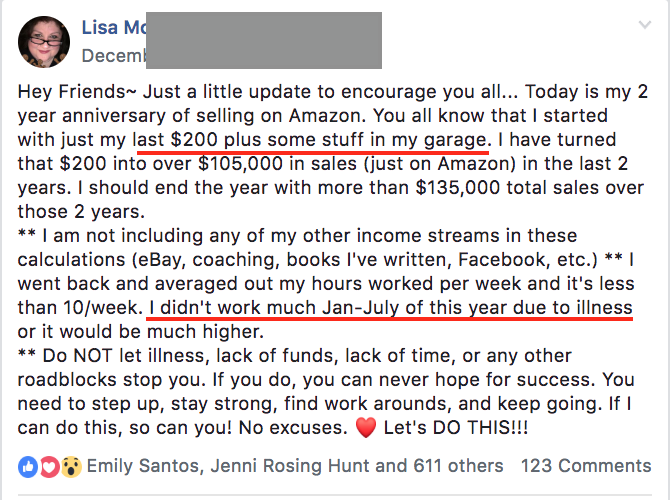 She made about $250/month in sales the first couple of months. By the third month, she started doubling her revenue each month. 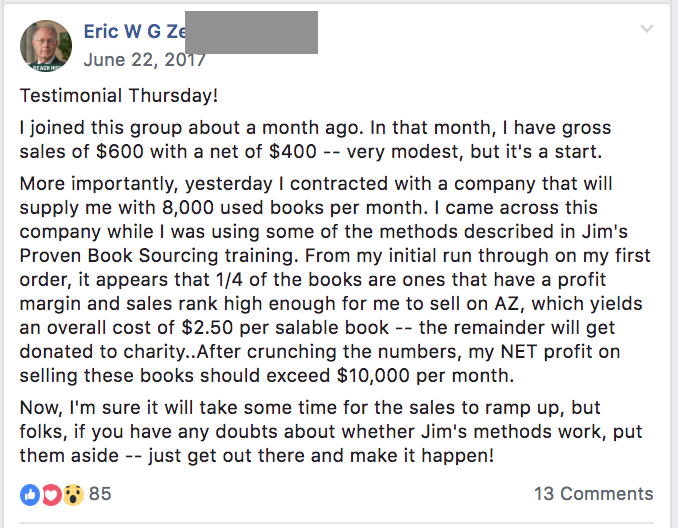 Within 6 months, she was able to replace her full-time income she lost by just selling used books online. We have hundreds of success stories just like this one. Or read Danny Stock’s story, who is also one of the content creators. He started an Amazon business because he was in deep financial problems; in fact, there was a time when he had to find all the loose change he could to get gas. Audio element not supported by this browser. Retail arbitrage is great business and that's how I got started. And just a little bit of background: when I got started retail arbitraging, it was out of necessity. We got into a real financial bind. My wife and I, shortly after we married, we had our first daughter was born three months early and we were in a real financial lot of stress at that point. My wife lost her job. Most of our medical bills were covered but there were still a lot of bills we handled. You can learn exactly how to do the same by applying what we teach in our new, step-by-step course for newbies, Amazon Selling 101. We can fill pages and pages of success stories—stories of people who went from struggling to meet ends meet to being able to support their families . . . and experience freedom in their life. We want you to be the next success story in our community. This is why we created a course that gives you only the foundational steps you need to take in order to build your business this week using arbitraging. Since there are many business models for selling on Amazon, why focus on arbitrage (flipping on Amazon products you find locally)? Because it is one of simplest, lowest-risk methods you can try today. And we’ve distilled the most important concepts you need to know about arbitrage and selling on Amazon to avoid overwhelm and to motivate you to start as soon as possible. 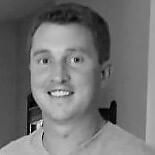 Module 3: Is My Product Profitable? Module 4: I Have A Product—What Next? You will learn the basics for making sure your product gets into customer hands, from listing on Amazon to shipping and getting paid. If you are tight on cash or don’t know where to start, but you want to build an Amazon business, we have the solution for you. Our goal in designing this course is to give you the essential steps you need to take in order to get started right away. This course is not designed for advanced sellers! It was designed with the newbie in mind. If you have been dabbling in selling on Amazon, but are only making a few hundred dollars in revenue, this course is for you too. If you aren't entirely satisfied with your purchase please call or drop us an email, and we'll issue a refund or offer a credit of your entire purchase amount. Take your time, check it out, and more importantly, put this powerful information to work for you. If you find it's just not for you, we don't want to keep your money. When you buy this course, you will become part of the most-supported Amazon selling community on the planet (support team, moderators, and coaches). It’s one of the many reasons why we are an A+ Better Business Bureau organization. ​The Amazon Selling 101 course covers tips and strategies that work now, so you can 2019 your best year ever! These tips and strategies are currently working for thousands of students in our communities. We've done the research, put together the content, and keep receiving stories of the life-changing results. You don't need to hesitate any longer to start selling on Amazon. Everything you need to get started has been nicely packed for you in our Amazon Selling 101 course—available to you at one low price.